My two younger sisters helped me celebrate my birthday last week with some special garden-themed gifts, several of which I incorporated into the setting for today’s vase. One is a refashioned and repurposed silver spoon stamped with the words, “Keep Calm And Garden On,” guidance I appreciate and shall try to follow. 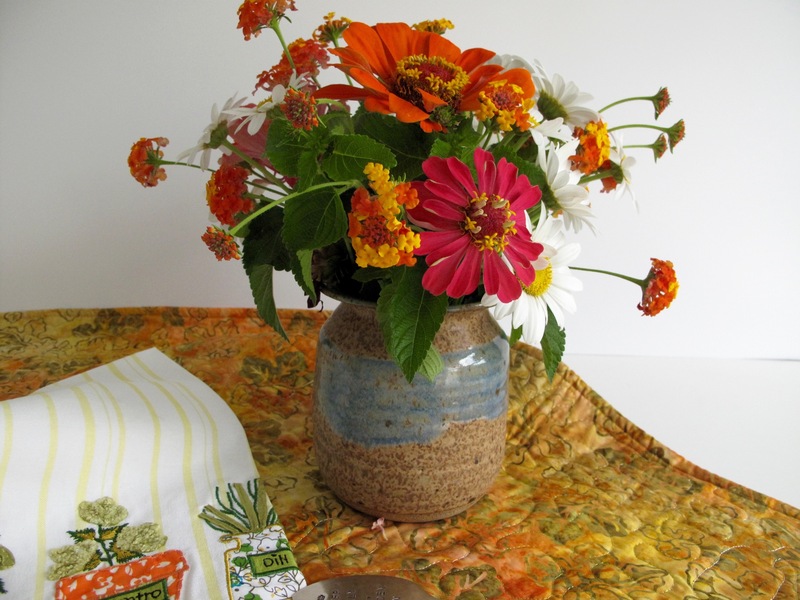 The arrangement sits atop a beautiful batik table runner made by my quilter sister. 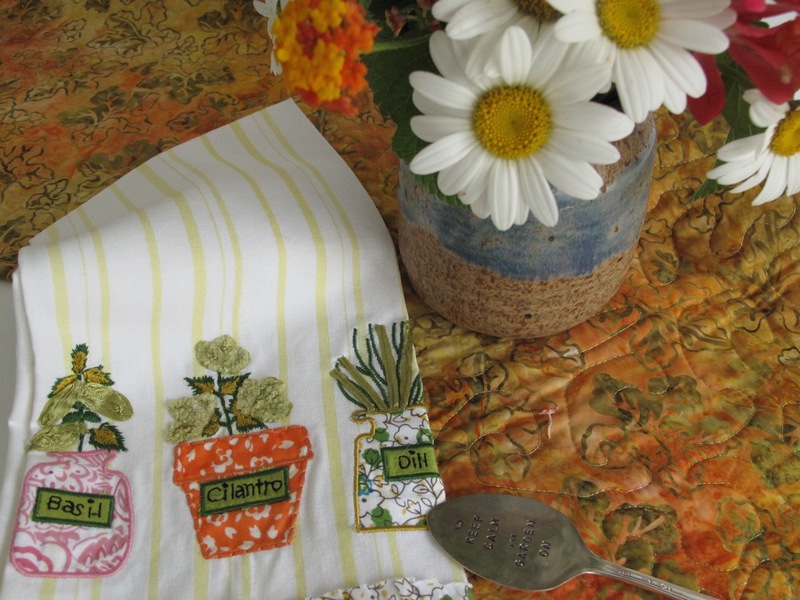 The colors in the fabric echo those of the today’s flowers as do those in the pretty kitchen towel with diminutive pots of herbs. I had not planned the vase around these items but they make nice companions. 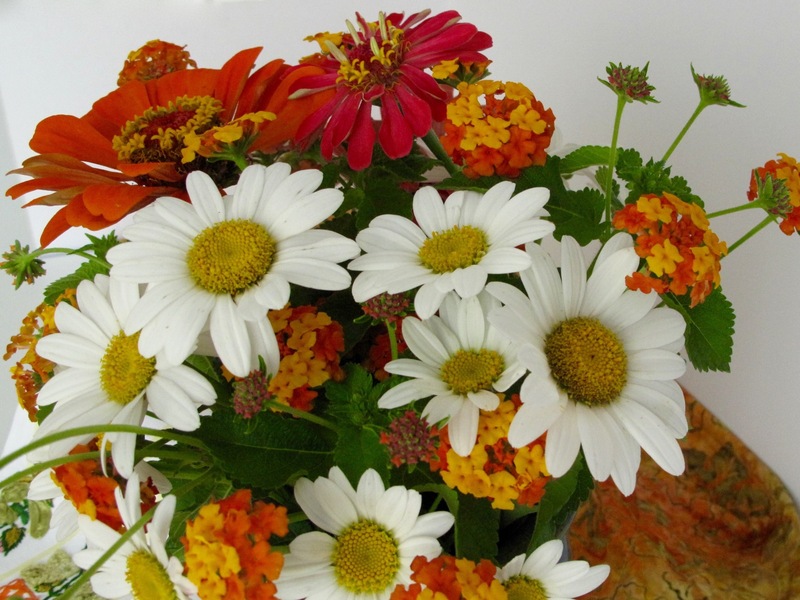 The flowers themselves are a simple summer bouquet of Shasta daisies paired with dark orange and deep pink Zinnias. Multi-branched stems of Lantana camara provide foliage as well as complementary floral accents in pink, orange and gold. This entry was posted in garden and tagged flower arranging, flower design, garden photography, in a vase on monday, Lantana camara (Common lantana), Leucanthemum x superbum (Shasta Daisy), nature photography, zinnia on July 20, 2015 by pbmgarden. I’m glad to make you smile Judy. I have it in the kitchen and it makes me smile too. I love knowing that we both have that bright crimson zinnia in our gardens, it makes me feel closer to you! A belated Happy Birthday, how lovely that you could share it with your sisters. The flowers may be simple but this vases seems to me to be full of joy. Thanks. This is a joyful vase Christina. Every time I pass by, it makes me smile. I’m happy for every zinnia that blooms as very few came up this year, but one of the zinnia collections I planted was all red, 4-5 inches across. They’re not that large though. Love these colors together! We certainly have enough heat for zinnias this summer, don’t we?!! Enough heat, yes, but I usually get some zinnias that reseed and that didn’t happen this year. Also out of 3 packets of seed, I’ve ended up with only 7 plants. Happy birthday! Love the colors this week, I wouldn’t have thought to mix the daisies in but they really pick up the yellows and lighten up the vase! We are in Florence SC this morning and feeling your heat! The daisies have done well this summer and I’ve been trying to deadhead them to keep them going (not my favorite job). They seem to want some company in a vase. It seems there is plenty of heat to go around this summer. Plenty of water and have a nice time. Thanks Beverly! Glad you enjoyed them. Thanks so much Eliza. I’m sorry to be so long in replying to you but just found your comment in my spam folder. The flowers were cheery indeed and long-lasting (until this morning actually). Happy Birthday, and many Happy Years gardening, and flower arranging. The vase is charming, and I love the colours. Thanks for the good wishes Noelle. I think that lantana makes everything pop. Gorgeous arrangement. 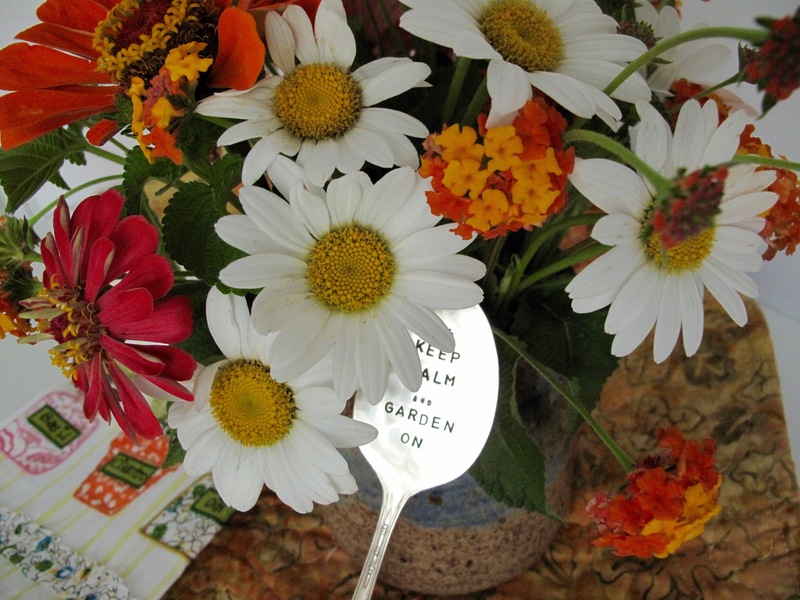 I love the cool white daisies with the hot zinnias. Thanks Jason. It’s a good year for daisies. Often they’re already dried up by now but I’ve kept them watered this year. Poor germination means there are very few zinnias this year, but I love these rich colors. A belated happy birthday, Susie! Your arrangement is bright and cheerful and your sisters’ gifts pair with it perfectly. Coincidentally, I have that very same spoon. Great coincidence Kris that we have the same spoon. That’s fun to know. And thanks for the good wishes. Yes, a bit of happenstance we should both be thinking of calm this morning. Lantana doesn’t have a pleasant odor but it seemed a perfect foil for the other flowers. Happy Belated Birthday. This is a beautiful arrangement coordinated with gifts of love. It works! LOVE always does. So true Stepheny. Thanks for the good wishes. I am sorry to have missed your birthday Susie! Wishing you a happy belated birthday! And what lovely remembrances including the vase which catches all the gorgeous colors. Love those zinnias. I had a lovely birthday Donna. Thanks for your good wishes. Only a few (7) zinnias came up this year. Can’t figure it out, but I do like the rich colors. Celebrating with sisters who understand you so well…what could be better. I’ll add my belated Birthday Greetings and add “celebrate on” to the spoon’s motto. 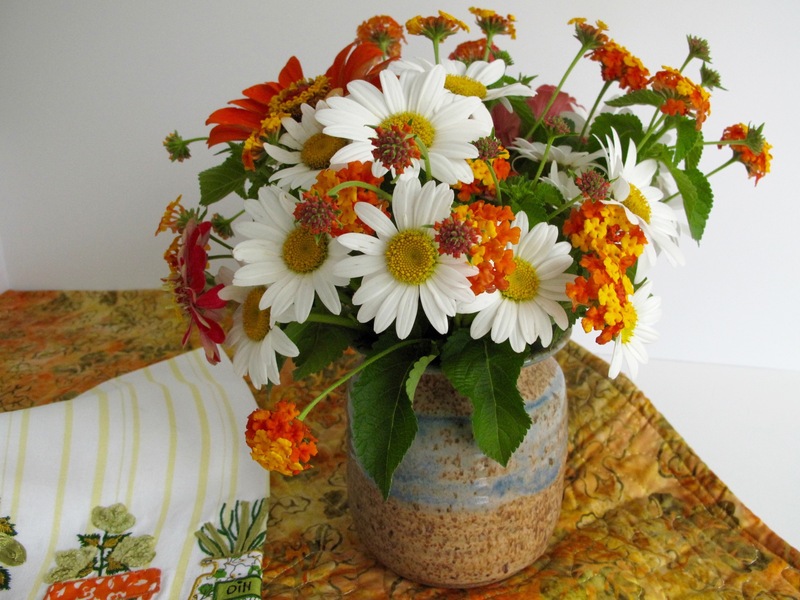 Love your lighthearted, cheerful vase. Thanks Rickii. It has been a nice celebration of my birthday this year and fun. I’m enjoying these flowers–they’re simple but happy ones. Belated birthday wishes Susie. What a lovely arrangement to celebrate with. 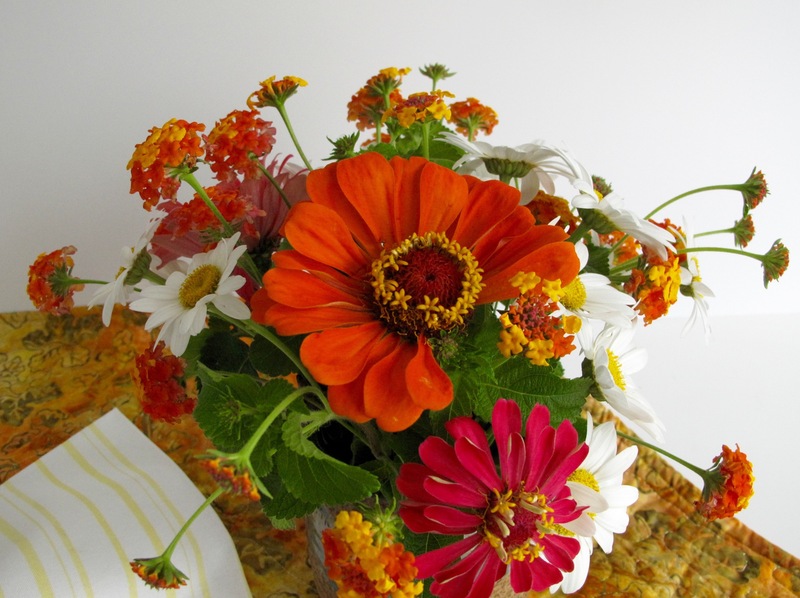 The zinnias and lantana are perfect together. Thank you Liz. I haven’t used lantana in arrangements often but it is lasting pretty well this time. The zinnias are very few this year, but they make up for it in size and rich color. Hot fire colours combined with white work so well. I would never have thought of partnering them but this combination in your vase is making me rethink. The strong gold color in the center of the daisies helps them stand up to the rich colors in the other flowers, perhaps. I adore white flowers. Yes, thank you. These flowers have brightened up the house. A belated Happy Birthday, Susie! I like your vase very much, it is so cheerful! Thanks Gina! It was a good birthday. Hope your zinnias will open soon. They can be just the thing on hot summer days. I might try to re-sow zinnias. Mine didn’t do well this year. Belated Happy Birthday! Wishing you calmness and plenty of time to carry on with your lovely garden. I never thought of Lantana as a flower fit for arrangement, but you have proved me wrong. They are so lovely and mix well with Zinnia and Daisy. Thank you! Previously I’ve used a short sprig or two of lantana if nothing else was available, but it actually has lasted very well this week and because it is so colorful it goes with a lot of different flowers. The smell is not very nice. Such a ‘happy’ looking arrangement with those colours. I used to love the tiny flowerettes of lantana as a child but it is now a ‘declared weed’ in most Australian States which means it’s prohibited to grow, cultivate or sell it.